NEW YORK - A man suspected of attacking four people with a hammer this week was shot and wounded by police Wednesday after he pulled a hammer from a bag and lunged at officers who approached him on the street near Penn Station, police said. Manhattan Chief of Detectives William Aubry said the officers - a male and female - were responding to an unrelated assault when they noticed the suspect and approached him. "When he turned around, he violently started swinging," Aubry said. New York City Police Commissioner William Bratton said the suspect attempted to assault the female officer with the "claw-end" of the hammer. "The female police officer then backed up into the intersection, fleeing the assault. She fell down. Her partner shot the suspect twice," Bratton said. The police commissioner added that both officers were taken to a hospital for treatment for non-serious injuries. The suspect was also taken to a hospital in critical but stable condition, Aubry said. 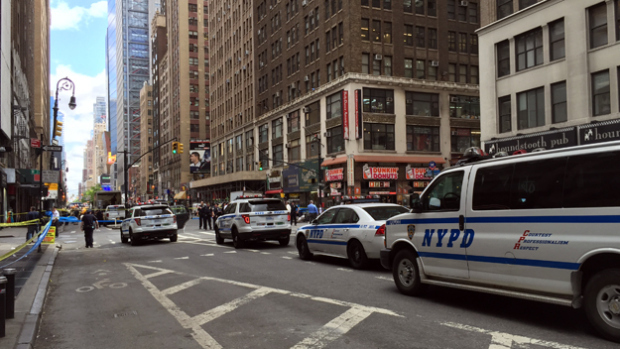 The incident took place shortly after 10 a.m., blocks from Madison Square Garden in midtown Manhattan. Traffic was stalled as police investigated the shooting. A hammer lay in the middle of the intersection at 37th Street and Eighth Avenue. Bratton said investigators have copious video of the incident. He commended the officers. Police said the man is the same person suspected of attacking four people with a hammer this week. On Monday night, a 34-year-old woman was struck in a park. A few hours later, a 28-year-old woman in Union Square noticed a man looking at her and he then pulled a hammer out of a bag and bashed her head. Another attack happened about 10 minutes later when a 33-year-old was struck from behind. Officers later discovered that a fourth attack happened earlier Monday in a different part of the city. A 20-year-old man was injured in that incident. Throngs of onlookers gathered as police set up a crime scene Wednesday. Anthony O'Grady, 26, said there was a chase and then the suspect turned around. "And they shot him," O'Grady said. He added that he was in Union Square earlier in the week when one of the hammer attacks occurred.